Much has been written on how the Confederate soldier set up his shelter while facing the rigors of the campaign. To many students of Civil War material culture, the notion that the average Confederate soldier relied on captured U.S. Army shelter halves, made use of some sort of “tent fly” when available, or simply did without, has become the prevailing interpretation. This “ragged rebel” mythology might have been best styled by Bell Irvin Wiley in his 1943 opus, The Life of Johnny Reb. This traditional understanding, however, belies the fact that from the early months of 1862 until the end of the war, the Quartermaster’s Department in Richmond managed to provide the Army of Northern Virginia and the Valley District with large numbers of both a standardized Fly Tent as well as many thousands of a unique Southern-made version of the Shelter Tent. The National Archives and Records Administration houses much of the surviving records of the Confederate States Quartermaster’s Department. These files document the efforts of a small office of Army officers and clerks, located just a few blocks from the State Capitol and next door to the Clothing Depot at the corner of 14th and Cary Streets in Richmond, tasked with providing for the welfare of troops in the region. The Army major commanding the office would describe his orders as part of a government report. I contract for the manufacture of Axes, Tents, Cooking utensils, Drums & Fifes, and in each case the contractor is detailed to report to me and is required to fulfill promptly his engagement, and in no case is the contract let to a subcontractor. Issues of existing stocks of military tentage continued into 1862. A newly formed infantry company was issued 3 Wall Tents Complete and 7 Privates Tents (Bell) upon arriving in Richmond in early April. (8) These stocks, however, along with whatever tentage of the current patterns that were being manufactured, were proving to be both insufficient in number and difficult to transport. On June 10, General Robert E. Lee wrote to Quartermaster General Abraham Meyers to complain of the lack of shelter for his soldiers. Butler & Co.’s 1862 tent contracts were primarily for Fly Tents, with smaller numbers of Wall Tents Complete and Hospital Tents Complete also included. No record has yet been found in the Quartermaster’s Department files to indicate that additional contracts for other types of tents were signed until 1864. (13) In fact, in one of his first acts after taking over for Major McClelland in October 1862, Captain William Bentley sent the remaining stock of 104 Bell Tents Complete and 26 Common Tents Complete, along with 1,000 Fly Tents, to Staunton to supply troops in the Valley. (14) From that point on, the Fly Tent would remain the predominant source of shelter for Confederate soldiers in Virginia throughout the course of the war. Butler & Co. remained the primary (and possibly sole) contractor for Army tentage during 1863. Surviving records can account for production of no fewer than 7,461 Fly Tents, none with poles or pins, in addition to 770 Wall Tents Complete and 121 Hospital Tents Complete in 1863. (16) Receipts for issues of the Fly Tent to the Army of Northern Virginia that year abound. A survey of General Pickett’s Division in the first half of the year shows almost exclusive use of the Fly Tent. In the 1st Quarter of 1863, the 3rd Virginia Infantry had 40 Fly Tents for 318 men (about 8 men per tent). In May, the 38th Virginia Infantry received 33 new Fly Tents in addition to whatever they already had for 445 men (about 13 to 14 men per tent if these were the only tents present). On June 30th, the 9th Virginia Infantry, then in Chambersburg, Pennsylvania, reported having 27 Fly Tents for 242 men (9 men per tent). (17) Considering the number of Fly Tents issued, it is reasonable to conclude that, by the summer of 1863, virtually every Confederate soldier in Virginia had come to rely on the Fly Tent whenever they were camped or transportation could keep up with a marching column. The production of Fly Tents by Butler & Co. continued at a steady rate through 1864. During the year the firm manufactured another 5,390 Fly Tents, along with 1,799 Wall Tents and 732 Hospital Tents. That year saw the introduction of two new types of tent for troops in Virginia: a Large Hospital Fly measuring 42 feet by 12 feet 9 inches (with a total of at least 330 made), and a copy of the U.S. Army’s shelter tent. 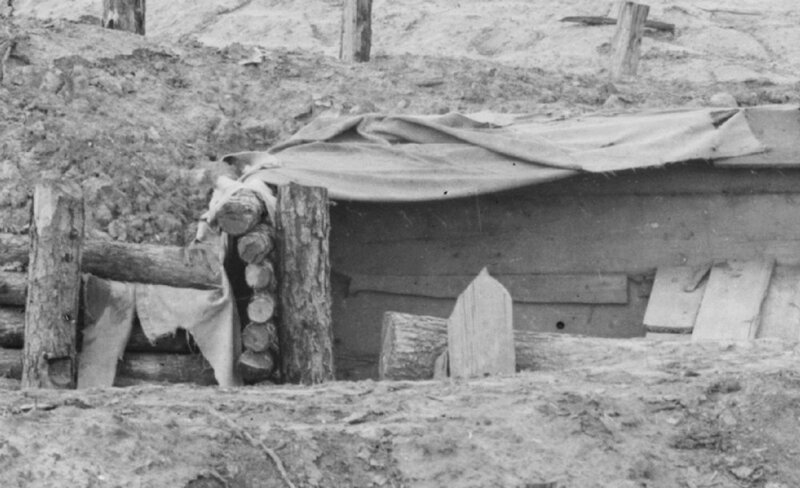 By 1864, many Confederate soldiers had seen, and certainly some come to use, the small shelter tents that had become commonplace among Federal troops in the East. Indeed, Butler & Co. accepted a contract to repair and replace the ropes on captured shelter halves, delivering over 1,000 of the pieces back to the government in May 1864. (18) General Lee’s April 5 General Order No. 27, along with specifying detailed transportation and camp equipment requirements for the Army of Northern Virginia, noted that “Shelter-tents will be issued to the troops as far as practicable.”(19) A letter from Lee’s aide-de-camp to General Longstreet on April 27 noted that the commanding general wished for superfluous Wall Tent flies to be cut into shelter tents. But what did these unique Confederate tents look like? Luckily, Bentley, having been recognized for his success in providing for the needs of the Army in 1863 and promoted to the rank of Major late in the year, wrote general specifications for all of the tents then being contracted for through his office. Report of cost of tents, quantity of cloth used to make them & cost of poles &c.
The Alfred May shelter half. With no known surviving example, the details of the Butler & Co. Fly Tent are a bit more difficult to ascertain. However, by examining the wartime records and other original tentage, the size of the tent can be identified and likely construction details can be determined with a reasonable degree of certainty. Wartime images of the Fly Tent consistently show a large canvas fly open on both ends. Even when taking into consideration the 19th century artistic proclivity for disproportion between structure and occupants, it is clear that the artists had seen a tent significantly larger than a Wall Tent Fly. Key to understanding the dimensions of the Fly Tent are the canvas requirements for Quartermaster’s Department tent contracts as well as the existing U.S. Army tent specifications that Southern manufacturers presumably followed to some degree. It is apparent from Major Bentley’s specifications and several surviving pieces of military equipment of other types, that 27 inch wide cotton duck, as opposed to the 28 ½ inch cotton duck as preferred by the U.S. Army, was readily available in Richmond. (27) Examining Major Bentley’s specifications, it would seem that the 41 yards 9 inches of canvas required to manufacture a Fly Tent was the same as would be required for the Hospital Tent fly, and nearly the same as what was required to manufacture a Hospital Tent fly according to U.S. Army specifications. The construction specifications for the Hospital Tent fly provide further clues as to the finished size of the Fly Tent. To be made of cotton duck, 28 ½ inches wide, clear of all imperfections, and weighing ten ounces to the linear yard. A three-inch tabling, to be finished on the ends, and two-inch tabling on the sides; six-thread Manilla line used under the tabling all around the fly. Strong grommet holes to be worked on the tabling near the ends of each seam and at the corners of the fly, of sufficient size to admit the lines; also near the ends of the ridge, to admit the spindles. Stay pieces for the corners and ridge to be of the same material as the fly, and to be one foot square. The fly to be made in a workmanlike manner in every respect, with not less than two and a half stitches of equal length to the inch, made of double thread of five-fold cotton twine, well waxed. The seams not less than one inch in width, and no slack taken in them. It is apparent that the Quartermaster’s Department in Richmond simply altered the U.S. Army’s tent specifications slightly to accommodate for the 27 inch wide cloth that local mills were able to produce. In contracting for the new Fly Tent in 1862 the Quartermaster’s Department ordered nothing more than copies of an existing fly already specified—the Hospital Tent fly—with the probable doubling of the grommets at the end of each seam to add the foot lines and a reduction in the rope required due to the lack of eave lines. The implications of the compiled Butler & Co. tent deliveries for the living historian are simple but potentially profound. From the 2nd Quarter of 1862 through the end of the war, virtually all of the enlistedmen in the Army of Northern Virginia and Valley District would utilize the Fly Tent. For much of that time, and for most of the armies, the Fly Tent was the only type of tentage either issued or available to the troops in quantity. The numbers produced by Butler & Co. were enough to supply the needs of troops in Virginia throughout the war, even factoring complete replacement on an annual basis. As most soldiers spent only a minority of their time in service on active campaign, and as being on an the march did not always imply the inability of transportation to keep up with the troops, it would seem that the average Confederate soldier serving in Virginia spent most nights under a 12 foot 9 inch by 20 foot piece of canvas with 8 or 10 of his messmates. While most authentically minded living historians generally eschew tentage, both due to the penchant for inaccurate canvas among the reenacting community and the preponderance of “campaign” themed living histories, there are certainly a multitude of potential opportunities to utilize the Fly Tent. It can be argued that, virtually any time a tent or fly is utilized while portraying Army of Northern Virginia or Valley District troops in camp or in the field, it should most appropriately be a Fly Tent, supplemented with shelter tents beginning in the 2nd Quarter of 1864. In recent years, some living historians have endeavored to produce tent flies in an attempt to imitate the often referenced Confederate shelter. Unfortunately, it appears that most have been based upon vague descriptions or postwar veterans’ accounts that, as the years went on, seemed to shrink the size of the fly while ever increasing the number of men it was required to shelter. Even accurate reproductions of the Wall Tent fly, while noble in their making and nonetheless useful, fall short of truly replicating the Fly Tent. While the task of hand sewing a large Fly Tent might seem daunting, the construction of any type of military tentage to 1860s specifications is rather simple and straightforward. Tents were manufactured with the same techniques utilized to make sails and awnings. Several surviving U.S. Army tents were made with cotton duck sailcloth with a blue stitching marker woven 1 inch from the selvedges. (34) While surviving examples of the 27 inch cotton duck woven in Richmond during the war lack the blue lines, Butler & Co. tents incorporated the same 1 inch seams and likely the same construction technique—selvedges overlapped 1 inch and felled on both sides at 2 ½ stitches per inch with doubled waxed cotton twine. As both Butler & Co.’s contracts note and the Alfred May shelter half attests, Confederate tentage had white cotton rope lines as opposed to the manila or hemp typically seen on U.S. Army tents. With 10 ounce cotton duck, ¼ inch cotton rope, heavy cotton thread, wax, and sailmaker’s needles easy to acquire, it takes only the time and motivation to sew approximately 11,000 stitches and 30 grommets to complete an accurate reproduction of the Confederate Fly Tent. In practice, this has proven to take about 20 man hours to complete. 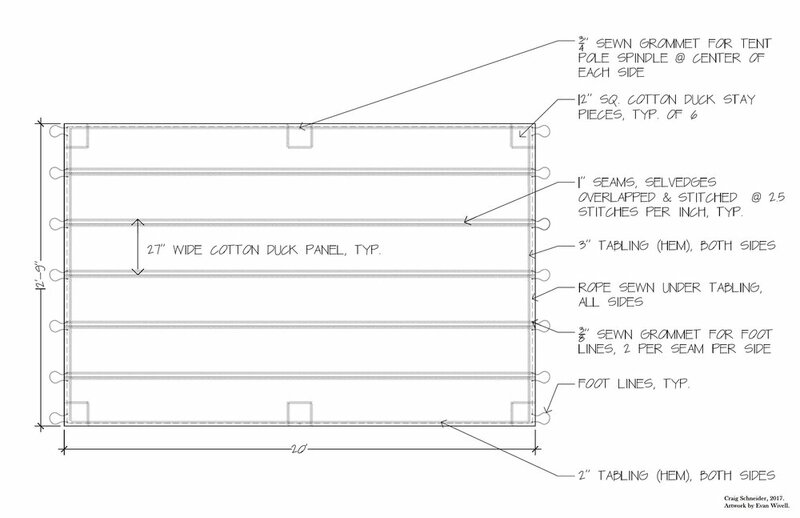 Construction of the Fly Tent first requires cutting 6 panels of 27 inch wide cotton duck to a length of 20 feet 7 ½ inches. As there is no readily available 27 inch wide cotton duck with a proper 19th century bound or “return” selvedge, wider duck will need to be cut to size and accommodations made for the seam allowance that will need to be pressed under to cover the fabric’s raw cut edge. As cotton duck can still be found with a bound selvedge, though usually not in a narrow width, the selvedge should be preserved and utilized in the construction of the tent as much as possible. If the fabric has a modern selvedge with cut weft yarns, additional width must be added to the panel so both edges of each panel can be pressed under. The image on the left shows two different cotton ducks with a modern selvedge, typically indicated by varying degrees of “frayed” or loose cut weft yarns. This edge should be removed or turned under when constructing any 19th century piece. The fabric itself, however, is acceptable. The image on the right shows a cotton duck woven with the type of bound selvedge that was characteristic of 19th century goods. This selvedge should be retained and utilized in the construction of the Fly Tent. 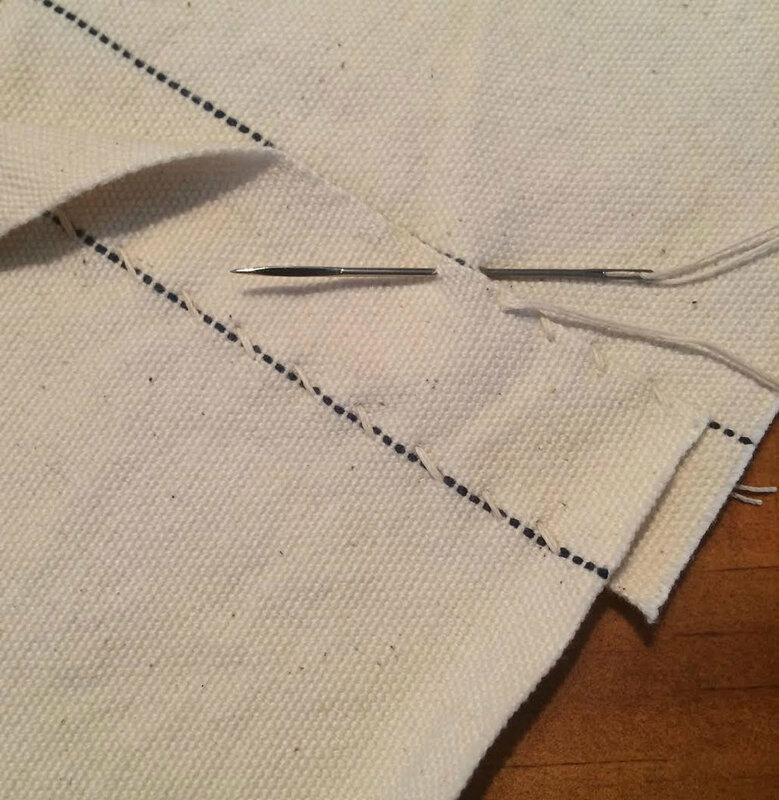 To best illustrate the manner in which the main seams are sewn, sailcloth that has a blue stitching marker woven 1 inch from the selvedge is shown. The seams of the Fly Tent were likely sewn in the same manner, though surviving examples of the tent cloth used by Butler & Co. do not have the stitching markers. The selvedge edge (or pressed edge) of one panel should overlap that of the next by 1 inch and be felled to the next panel with doubled thread at 2 ½ stitches per inch. The panels should then be turned over and the other selvedge or pressed edge felled to the first. When all 6 panels have been sewn together, the long sides of the fly can be pressed under 2 inches and the raw edge of the short ends pressed under ¾ of an inch, then an additional 3 inches, to form the tabling. There is little evidence to indicate whether or not the Confederate Quartermaster’s Department required, or that Butler & Co. followed, the existing U.S. Army specification to include rope under the tabling. This was a common practice in producing awnings, similar to how sails were manufactured, and necessary to keep the edges of Wall Tent and Hospital Tent flies from stretching. However, the rope would not have been as important to the stability of a tent with ends pinned to the ground. (35) In fact, U.S. Army specifications did not require rope to be used in the tabling of tents pinned to the ground. Nevertheless, if the Fly Tent was constructed exactly as per the Hospital Tent fly of the same dimensions, or if consideration was made of its potential to be used as a fly in addition to being used as a tent with open ends, it is possible that the rope was retained. Unfortunately, photographic evidence showing clear detail of the tabling on a Confederate Fly Tent has yet to be located. While several images exist of abandoned Confederate winter camps with huts that likely had a Fly Tent for a roof, few photographs have been found to date that include what are possibly Fly Tents. In one photograph, a small portion of the tabling is visible on the torn remains of a fly still partially covering a shelter inside Battery 25 at Petersburg after its capture. The image does not provide indication that would point to the presence of rope sewn into the tabling or not. (36) The amount of rope needed if sewing it into the tabling has been included on the list of materials required. Portions of the tabling can be seen near the bottom left corner of the image and on the folded portion above the shelter. After closing the tabling, 12 inch square cotton duck stays (reinforcement patches) should be felled onto the corners and at the center of each long side edge. Grommets cut to fit ¼ inch rope (about 3/8 inch in diameter) should be sewn along the ends, two in each corner and one on each side of the panel seams. One grommet cut to fit a 5/8” tent pole spindle (about ¾ inch in diameter) should be sewn onto each of the stays on the sides, near the edge of the tabling. Fourteen foot lines (rope loops to attach to tent pins) should be attached to each pair of grommets in the corners and along the end tabling. Ropes cut to 18 inches and secured at each end with an overhand knot would measure about 16 inches in the clear and match surviving tents and the existing specifications. As the number of poles and pins manufactured specifically for Fly Tents was negligible and many were quickly disposed of, their possible appearance will not be discussed here. If one desires to make a set, the dimensions and construction can be extrapolated from the existing specifications in Meigs’ General Order, No. 60, the unpublished 1865 Quartermaster Manual, or other later 19th century Quartermaster Manuals that contain identical specifications. It is clear from soldiers’ accounts that makeshift tent poles were acquired whenever the Fly Tent was to be pitched. William Day of the 49th North Carolina Infantry described setting up a Fly Tent in October 1862. For the living historian, the Fly Tent should most typically be pitched using poles made of cut trees. The length of the uprights could, and certainly did, vary. As a general guide for the length of the upright poles, it should be noted that a pole approximately 7 ½ to 8 feet in length would allow for the tent to be pitched at an angle matching the slope of the roof on Hospital and Wall Tents. Period images of the Fly Tent seem to show similar dimensions. In modern practice, the Fly Tent has proven to be a comfortable shelter in all but the worst weather, and a suitable roof for a winter hut housing a dozen men. Cutrer, Thomas W. and T. Michael Parrish, eds., Brothers in Gray: The Civil War Letters of the Pierson Family (Baton Rouge: Louisiana State University Press, 1997), 84. Wiley, Bell Irvin, The Life of Johnny Reb: The Common Soldier of the Confederacy (Indianapolis: Bobbs-Merrill, 1943), 246. Compiled service record, William Bentley, Major; Compiled Service Records of Confederate Soldiers, Record Group 109; National Archives and Records Administration, Washington, DC. Compiled service record, J. B. McClelland, Major; Compiled Service Records of Confederate Soldiers, Record Group 109; National Archives and Records Administration, Washington, DC. The War of the Rebellion: A Compilation of the Official Records of the Union and Confederate Armies, Part III, Series I, Volume XI (Washington, D.C.: Government Printing Office, 1896), 585.
Business record, James T. Butler & Co.; Confederate Papers Relating to Citizens or Business Firms, Record Group 109; National Archives and Records Administration, Washington, DC. The War of the Rebellion: A Compilation of the Official Records of the Union and Confederate Armies, Part III, Series I, Volume XII (Washington, D.C.: Government Printing Office, 1885), 892.
Business record, James T. Butler & Co.; RG109, NARA. Compiled Service Record, William Bentley, Major. ; RG109, NARA. Compiled Service Records of Confederate Soldiers Who Served in Organizations from the State of Virginia, Record Group 109; National Archives and Records Administration, Washington, DC. The War of the Rebellion: A Compilation of the Official Records of the Union and Confederate Armies, Series I, Volume XXXIII (Washington, D.C.: Government Printing Office, 1891), 1264. Cowan’s Auctions, American History, auction catalog, Cincinnati, OH, June 12, 2015. May, Alfred collection, North Carolina Museum of History, Raleigh, NC. Business record, John and George Gibson; Confederate Papers Relating to Citizens or Business Firms, Record Group 109; National Archives and Records Administration, Washington, DC. Omenhausser, John, “Richmond Mess,” 1862, watercolor, American Civil War Museum, Richmond, VA.
Jackson, Mason, “Night Amusements in the Confederate Camp,” 1863, engraving, New York Public Library, New York, NY. American Civil War Museum Collection, American Civil War Museum, Richmond, VA.
Meigs, M. C., “Specifications Concerning Tents: General Orders, No. 60” (Quartermaster General’s Office: Washington City, 1864). The War of the Rebellion: A Compilation of the Official Records of the Union and Confederate Armies, Series II, Volume VI (Washington, D.C.: Government Printing Office, 1902), 557. Original Civil War tents larger than a shelter half that are known to have survived include a Wall Tent at the National Museum of Civil War Medicine in Frederick, MD and a Sibley Tent and Wall Tent at Shiloh National Military Park in Shiloh, TN. Quartermaster General of the Army, Specifications for Clothing, Camp and Garrison Equipage, (Philadelphia: Quartermaster’s Department, 1889). Shiloh National Military Park collection, Shiloh, TN. Russell, Andrew J., “Petersburg, Va. Confederate fortifications with cheveaux-de-frise beyond,” Library of Congress, Washington, DC. William A. Day, A True History of Company I, 49th Regiment North Carolina Troops (Newton, N.C.: Enterprise Job Office, 1893), 29.